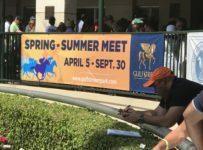 The payoff on the Rainbow 6 at the Gulfstream Park West meet was $1,464.30 on Sunday, the closing day of the meet that was held at Calder in Miami Gardens, Fla. The attraction of a mandatory payout drew $637,163 of new bets into the Rainbow 6. The carryover coming in was $123,189. There were approximately 403 tickets with the winning horses on the 20-cent per combination only bet, according to calculations by HorseracingFLA. Post position numbers of the winning horses were 8-4-5-4-4-9. Four winners were favorites and the other two winners had odds of 5-2 and 7-1. The betting pool was the highest in the Rainbow 6 at the 40-day GP West meet, and far surpased last year’s final day at G.P. West. 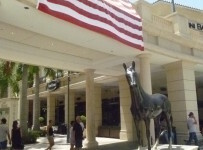 Meet sponsor Gulfstream Park had a mandatory payout of the full coming-in carryover plus 80 percent of the day’s new Rainbow 6 bets. A Florida law prohibits pari-mutuels from extending a carryover into a succeeding meet. Gulfstream on Saturday Dec.1 will open its 2018-2019 championship meet at its track in Hallandale Beach. On non-mandatory days, Gulfstream pays out the Rainbow 6 jackpot only if there is just one ticket with six winners. When there are no such tickets on non-mandatory days Gulfstream takes out 20 percent of the day’s Rainbow 6 bets, divides 56 percent among multiple tickets with the most winners (usually six) and adds 24 percent to the carryover.